The Karger Topic Article Package is a new keyword and subject-based customer-oriented product that contains preselected journal articles and book chapters from across the entire range of the Karger publishing program, covering individual fields of interest. The semantic search-based selection of articles and book chapters includes only highly relevant search results and guarantees a maximum level of customization and individuality for our customers and their needs. The structure of this product will be continually refined in close cooperation with our users to cover all their requirements efficiently and effectively. 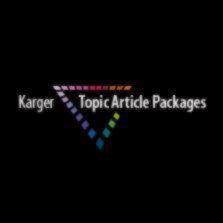 Follow this link for more information on Karger Topic Article Packages. Discover the journal articles and book chapters on diabetes most relevant for your research! The Topic Article Package Diabetes provides a quick and convenient overview of Karger content in the field of Diabetes research. Here you will find all the articles and book chapters which have appeared in renowned international top journals and books published by Karger. The selection criteria for this package are based on a keyword-related semantic search on the abstract level. Journal articles and book chapters are specifically filtered and matched to the subject of diabetes.